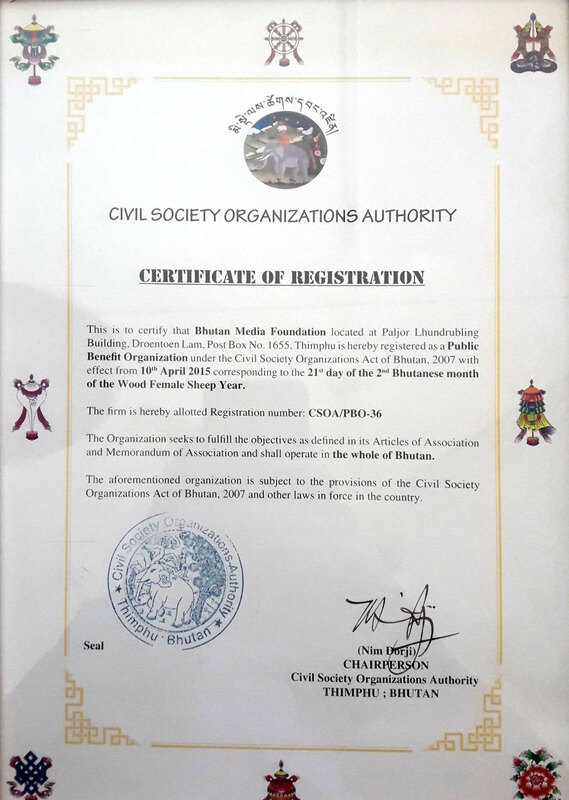 BMF was registered as a Public Benefit Organisation (PBO) with registration number CSOA/PBO-36 under the Civil Society Organisations Act of Bhutan 2007 on 10 April 2015 corresponding to the 21st Day of the 2nd Bhutanese month of the Wood Female Sheep Year. As a registered CSO, BMF gains the opportunity to fund raise and seek support from diverse sources both within and outside the country. It further strengthens BMF’s responsibility to function as a civil society organisation to strengthen the media and help sustain democracy in Bhutan. However, BMF continues to be guided by the vision and aspiration of its founder, His Majesty the King. BMF is fortunate to have the blessing and guidance of His Majesty the King and also the acceptance of the civil society organisation.